ARCHOS, an award-winning innovator in consumer electronics, is pleased to introduce the ARCHOS 97 carbon, the first of its new tablet range called “ELEMENTS”, an entry-level line up of 7, 8, and 9.7 inch tablets that combine ARCHOS design and engineering with full access to Google PlayTM and a full suite of Google apps at an affordable price. Equipped with the latest mobile technology and an elegant aluminum finish, the ARCHOS 97 Carbon is only 21.8 ounces and 0.45” thick. Its sharp and clear IPS multi-touch screen delivers amazing vivid colors and impressive wide viewing angles. 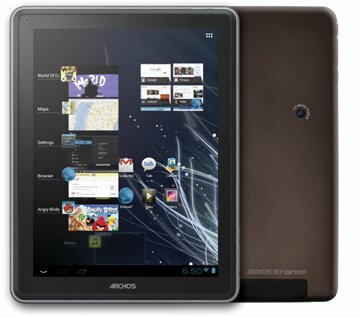 For the smoothest interface experience, ARCHOS has powered this tablet with a fast 1GHz processor, 1GB of RAM while running AndroidTM 4.0 “Ice Cream Sandwich”. Combining very high performance hardware, intuitive software and affordability, this Google PlayTM supported device will be available starting in July 2012 for $249.99 SRP. Optimized for Google PlayTM: Over 600,000 apps apps and games, the world's largest collection of eBooks, millions of songs, thousands of movies, and a growing selection of TV shows and magazines.